Petal Talk: Of Course They Come in Blue--Bring on the Spray Paint! Of Course They Come in Blue--Bring on the Spray Paint! 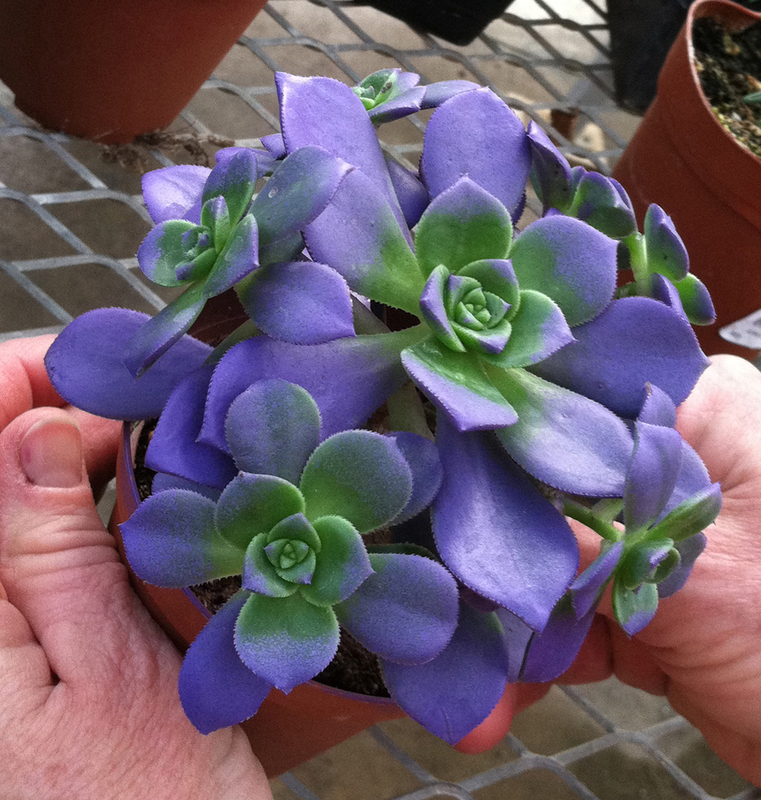 I'm still getting comments on the piece I wrote about a succulent that had been painted blue, apparently, to gain the attention of unsuspecting consumers who don't realize that it isn't real. It would have been nice if the plant come with a label disclosing that it had been spray painted and eventually grow out of its color. Advertisers have figured out what the consumer wants, which is why the term "new" is used so often. We like to try/see/taste/grow/have things no one else has tried/seen/tasted/grown/had. Other popular buzzwords are "energy-efficient," "organic," and "gluten-free." It's the consumer's perception that causes him to gravitate toward these icons and what they represent. Anyway, we've all felt swindled or cheated at some time in our lives. My friend the horticulturist felt a bit sheepish, I'm sure, but it was very early spring and cold and gloomy outside. The plant was $10, which means she paid at least twice what the Echeveria was worth. But in the big scheme of things, it was a relatively inexpensive lesson to learn. Should there be warnings or laws that protect us from these fraudulent claims? Warnings, perhaps. Laws, I don't think so. With laws like that in place we'd never have "glitter mums," or deep blue carnations at our local supermarkets. And why else would they be selling if somebody out there likes them. Why else would the Martha Stewart website offer instructions for putting glitter on roses? Dyed and spray-painted flowers (fresh is relative, I guess) also are available. Although, to me, the look created here might as well be made of paper, cloth or even plastic, somebody out there likes them. I found some information on how florists dye flowers on the ProFlowers blog. I'm not a fan, but as my mother used to say, "It takes all kinds."